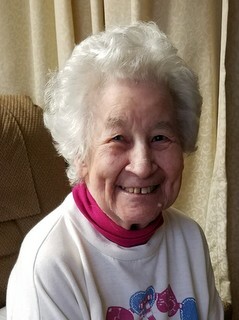 Christine Giguere, age 83 passed away peacefully on March 16, 2019 at Rae-Ann Nursing Home in Westlake, Ohio. Dear mother of Christal (Rafael) DeJesus, Karen (Michael) Baugh, and Cynthia Giguere; cherished grandmother of Shannon (Denzil) Swanner, Misty Thomas (Greg Thomas), Hollie Brezovsky, Rudolph Brezovsky, Belinda Giguere, Christina Giguere, Amanda Hill, Samantha Hill, and Hillory (Sandra) Hill ; loving great grandmother of Ronnie Anderson, Crew Anderson, Skylin Swanner, Amanda Thomas, Paige Thomas, David Brezovsky, Austin Brezovsky, Jacob Brezovsky, Julia Brezovsky, Autumn Brezovsky, Summer Brezovsky, James Clevinger, Dylan Hill, Charles Caldwell, Kylee Caldwell, Haylie Hill and the late Harper Hill. Family and friends whose lives were touched by Christine are invited for her funeral service Thursday March 21, 2019 at 12:00 PM at Slone & Co. Funeral Directors, 13115 Lorain Ave. Cleveland, Ohio 44111. The family will receive friends 10-12 Noon. I’ll never forget dear Aunt Chris, or lovingly known as crabby Chrissy. She helped me learn how to drive and pass my driver’s test. She was a kind and generous woman.